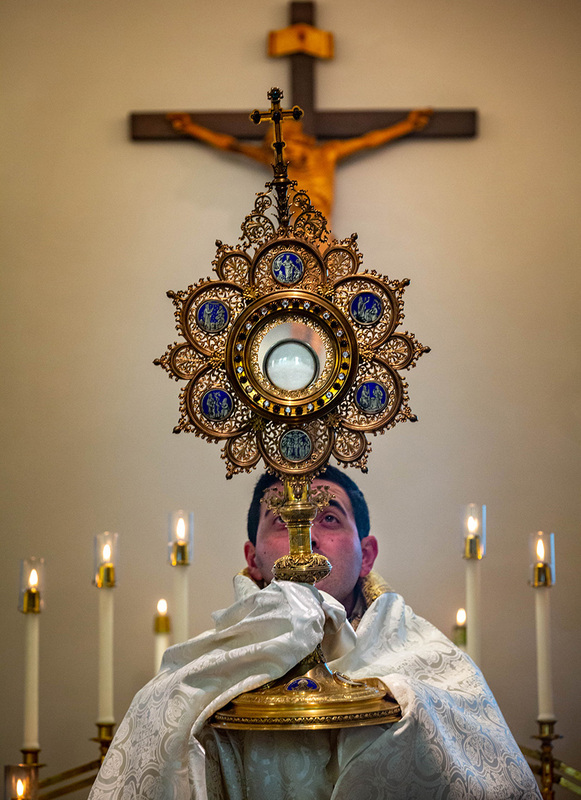 Father Fadi Auro, assistant professor of philosophy and formation advisor at Kenrick-Glennon Seminary, elevated the monstrance during the seminary’s Forty Hours devotion Feb. 16. Most of us know that the number 40 is biblically significant. Examples are plentiful: During the time of Noah, it rained for 40 days and nights. The Israelites wandered the desert for 40 years. Christ fasted and prayed for 40 days before the start of his public ministry. And of course, there’s the 40-hour period between His burial and the Resurrection. Forty Hours devotion is — quite literally — 40 hours of continuous prayer before the Blessed Sacrament. A centuries-old practice, it is an affirmation in our belief as Catholics in the Real Presence of the Lord in the Eucharist. “Lumen Gentium,” one of the principal documents of the Second Vatican Council, notes that the Eucharist is “the source and summit of the Christian Life” (“Lumen Gentium,” No. 11). Forty Hours devotion fell out of practice in the decades following the Second Vatican Council, but some parts of the Church have seen a renewed interest. In the Archdiocese of St. Louis, Kenrick-Glennon Seminary regularly hosts a 40 Hours devotion. Another example is St. Francis of Assisi Parish in Oakville recently offered it for the first time this Lent, in late March. The devotion generally begins with a solemn Mass and procession with the eucharist, followed by exposition at the altar. During the next 40 hours, people gather for personal or public prayer in adoration. If a church offers regular daily Mass during the 40-hour period, the Eucharist is reposed in the tabernacle at that time. At the end of adoration, a Mass of Reposition might be celebrated, following with another procession, and ending with Benediction and final reposition of the Eucharist.